For as long as I can remember, my mom has been making lemon meringue pie for every holiday dinner and it’s become a tradition in our home. It’s one of my favourite desserts and is pure heaven! She’s actually tried to make them from scratch and they never turn out which is why she only uses Shirriff Lemon Pie Filling. It always turns out! When I was contacted to do a review for Dr. Oetker I was ecstatic since I knew they were the makers of my mom’s beloved Lemon Meringue Pie. 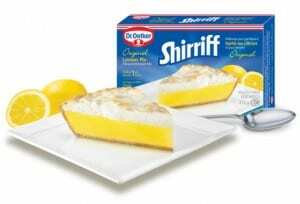 Dr. Oetker actually makes quite a few products beyond Shirriff Lemon Pie Filling. They have frozen pizzas, Sauce n’ Cake (John calls this “messy cake” and eats the whole thing), Mousse mixes, Puddings, and Shaker Mixes. Their product line makes me hungry! John and I picked up a Bacon pizza and a Deluxe pizza for supper. John’s a big eater so we needed to buy 2 pizzas to feed us. The Deluxe Pizza is topped with pepperoni, peppers, red onions and mushrooms while the Bacon is topped with onion, bacon and two types of cheese. I popped both in the oven to cook and they were ready in know time and turned out perfect. The crust was excellent- thin & crispy the way I like it. The toppings tasted fresh and bursting with flavour and the sauce rich and spicy. Topped with the melted cheese, it was a satisfying meal. Let’s just say there was no leftovers. 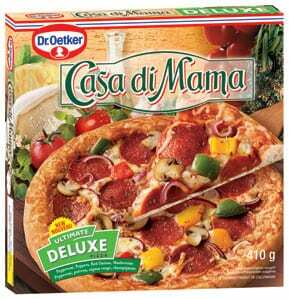 We actually went out grocery shopping yesterday and I stocked up on more of the Casa Di Mama pizzas for the holidays when we have a full house. This is so quick and easy to make! You do need a handheld mixer though to get it to the right consistency. Just add the mix and milk, mix it up with your mixer and put it in dessert bowls and chill in the fridge for a few hours. The French Vanilla is to die for! I cheated and was eating it right from the bowl. After a few hours in the fridge, it’s even better- light and sweet. I have been craving it since I made it last week. I will definitely be buying more of it. I tried the chocolate and vanilla pudding. I made the chocolate in a pie for John and ate the vanilla in bowls just as a pudding. For John’s pie, I used a graham cracker crust and topped with some marshmallow fluff. This guy loves S’mores so it was my version of S’more pie….very rich and sweet! I preferred the vanilla pudding and it was nice evening treat. I am itching to try the coconut pudding and make myself some coconut cream pie! I saved the coolest product for last- the Dr. Oetker Shaker Mixes. They have Shaker Muffins, Shaker Cupcakes and Shaker Pancakes. I think they were reading my mind when they made these products. You make the product right in the packaging- seriously! It’s so easy and convenient and there’s no dishes. I ALWAYS make a huge mess in the kitchen no matter what I am cooking. It’s one of the reasons I don’t like to cook that much is because I make such a mess and hate having to spend an hour trying to clean it up. I use every dish in the kitchen it seems. Anyways, this product you just add milk (or water) and shake and then pour right into the muffin tins or in the pan for the pancakes. 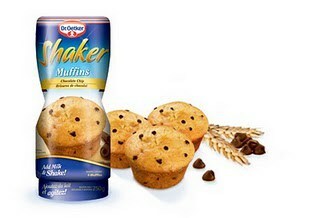 The Shaker Muffins are available in Chocolate, Blueberry and Banana Bran. The Blueberry was our favourite and I still can’t get over how simple it was to make. I filled the shaker mix to the fill line with milk, closed the lid and then shook it hard for a bout a minute. Then I poured the mix into my muffin tins. It makes 6 muffins so you will need two mixes if you want a full dozen. It’s great if you want to make fresh muffins though every other day and it’s so simple. It would be an easy snack to make for a child’s school lunch.Same deal with the Shaker Cupcakes. Just add milk and shake and bake. They come in Vanilla and Chocolate and make 6 cupcakes. Yummy! Pancakes are always so messy for me to make with all the bowls, spoons, measuring cups, etc. With the Shaker Mix, add milk and shake and pour into the hot pan. They turn out just right- light and fluffy and with real Canadian maple syrup are delicious. They come in Buttermilk and Chocolate Chip. On your next trip to the grocery store, pick up some of Dr. Oetker’s Shaker Mixes, pizza or dessert mixes and see why they have become a fixture in our home. Bye Bye Google Page Rank | Hello mozRank!